Since eLectio Publishing released Nightmarriage to the general public on May 28th, a lot has happened. The book has fifteen reviews on Amazon, including thirteen five-star reviews—not a bad start at all. Joshua Madden’s brainchild, Boompopmedia.com, has published information about my forthcoming book signing in Lawrence here. The resulting piece warns that I am “too good-looking to write for Boompopmedia.” What can I say? Truth is truth. Hallmark Master Artist Stacey Lamb was kind enough to have Nightmarriage bookmarks and book-signing posters manufactured on her dime for me. What a sweetheart! That being said, come to my book signing at Signs of Life in Lawrence, Kansas, on August 3rd from 1-3 p.m.
Blues singer Bobby Bland died on June 23rd. He played with none other than B. B. King—a member of African-American royalty, to be sure. The curse chronicled in “Honeymoonwalking (to Jail)” lives on! R. I. P., Bobby. Hopefully 2014 will prove more merciful. Joseph Kyle (mastermind behind music publication The Recoup, music critic for The Big Takeover, former contributor to No Depression, Pitchfork) gave Nightmarriage five stars on Amazon, and took a picture of himself reading the book outside of Hastings, thereby paying homage to the essay, “The Art of the Pity Party, Perfected.” It was one of several highlights of the past few months for me. The irony: Joseph is single, so who is he pulling this stunt for? Perhaps his 85-year-old father, who also read and enjoyed the book. Then there is the story of our new Hyundai Santa Fe—my set of wheels, not Becki’s. We found it online via cargurus.com at a dealership in Melbourne, Arkansas—a town of 1,500 people located some six hours away from lovely Lawrence, Kansas. It had a nice price tag on it, the car fax checked out, and we consulted with a family friend who happens to be a car dealer, too. When I called the dealership to inquire about the vehicle, the person who picked up the phone turned out to be one of the kindest people one could ever hope to meet. I sensed nothing shady about him at all, which blew my idea of used car salesmen to smithereens. Kendall is the father of a boy named Bradley who is only a few months older than Evie, too—a decided bonus! “Uh . . . yes?” I said. “Is your mind blown, man?” Kendall said. “Yes, Kendall,” I said. “My mind is blown.” Like tires on a car after the driver fails to pay the toll and insists instead on driving onward, spikes puncturing rubber, inflicting severe damage. A random phone call to a stranger in Arkansas. A strange connection with a man named Kendall whose wife was reading Nightmarriage on her Kindle. Serendipity and wordplay, too? Right up my alley. We planned to meet Kendall halfway between Melbourne and Lawrence in the sunny city of Springfield, Missouri, but there was a delay involving a part that needed to be replaced before we became the vehicle’s owners. Kendall offered to—and made good on his promise to—drive the vehicle all the way from Melbourne to Lawrence last Thursday. He was just as nice in real life as he was on the phone. He drove away in my Dodge Stratus—the one featured so prominently in Nightmarriage, especially in “Hearts and Jumper Cables.” I consider him part of the book now in a weird way. Truth is stranger than fiction. I also had the privilege of interviewing singer-songwriter Sam Phillips at the beginning of June for a two-part, forthcoming piece for IMAGE Journal‘s “Good Letters” blog. 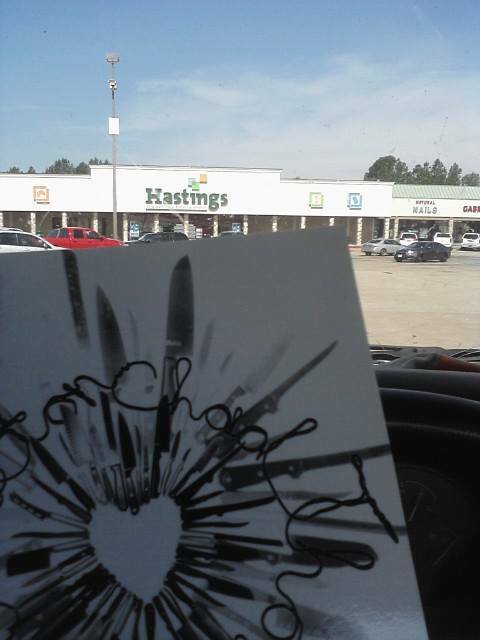 We talked for almost two hours, and she expressed interest in my book. In fact, she insisted on buying it to support me as a writer, but I counter-insisted on mailing her a signed, personal copy. She compromised, agreeing to buy the e-book version so my gift would not be a complete and total redundancy. Sam’s new record, Push Any Button, releases on August 13th. Pre-order it at samphillips.com, and receive an instant download of the album track, “Things I Shouldn’t Have Told You.” I already have the album, and I can tell you with confidence that it is worth buying. A 101-year-old woman who attends my dad’s church read it and told my parents she “could not put (Nightmarriage) down” once she started reading it. I thought this was incredibly sweet. The people at my parents’ church have been very supportive of the book in general. Take Mary, for example, who ordered twenty-one copies because she couldn’t decide who not to give the book to as a gift. My friend Brandon S. Gillette, whose ax appears on the cover of the book, and who appears as a real-life character in the book, noticed a simple but humorous typo in one of the chili recipes in the appendices: It called for “1 bear” instead of “1 beer.” Oh, the difference one letter can make. I told him and my publisher that I wanted to leave the typo in the recipe. Who knows? Adding one bear to the recipe might be a masterful move! Finally, my friends Bryan and Christy Miller moved back to Lawrence after moving to Princeton, New Jersey, a few years back so Bryan could go to divinity school. Now that Bryan is a god (that’s what people get degrees in divinity for, right? ), he and Christy returned to Lawrence just so she could tell me that I unwittingly published her name incorrectly in the book not once, but twice. Her name appears as “Christy Fiola Miller,” but apparently her middle name is not actually “Fiola” at all. The name is an inside joke she shared with one of her piano students. Knowing this, I wish I could recall the book and change her middle name to “Skeletor” or something equally absurd. “Fiola” just seems too plausible to be a joke. Keep reading, folks, and send me your Nightmarriage-related stories. I love hearing them! The meme below, which features my daughter Evie yelling “Noooooooooooooooooo!” at breakfast a few days ago, is featured at Pinterest here. 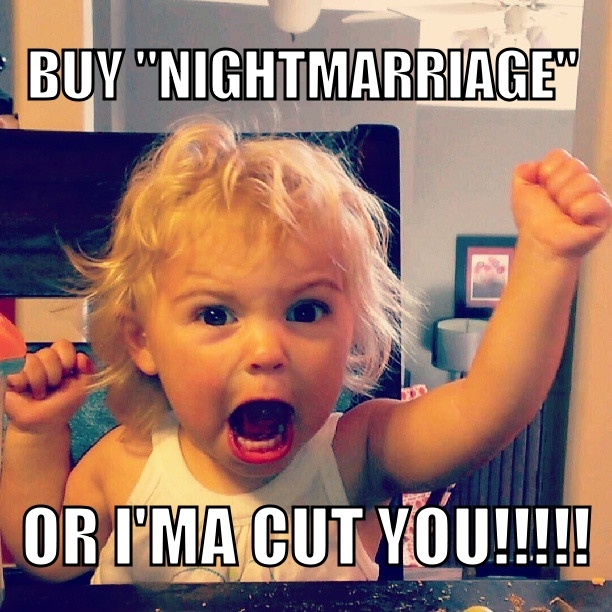 Share it, and help us sell Nightmarriage to the public! Becki Johnston took the photo, and suggested that the photo would make a great meme. Joseph Kyle supplied the text, and I put it together. Previous postTransformer: Exploring Todd Solondz’ "Palindromes" Through the Eyes of the Russian Formalists Next post"Nightmarriage" Color Edition Now Available for Exorbitant Price!